Pulsar LED Time www.pulsarledtime.com specialise in repairing and servicing old LED Electronic Digital Watches that were made in the 1970's by Pulsar, Hamilton and Omega watch companies. Introducing the PLT-1 & PLT-2 Replacement LED Watch Modules, the modern LED replacement LED Watch modules to repair an un-repairable Pulsar, Omega or Hamilton LED Watch! We are on Skype!, User ID "ben_arsc"
The Racal VRM-5080 is a modern 50 Watt VHF FM Radio Transceiver designed for installation in armoured or soft-skin military vehicles. The radio covers the 30 to 76 MHz frequency band and comes with an integrated control / keyboard unit with a built in Red LED readout display. The radio incorporates a built-in test sequence which automatically checks transceiver performance and displays results. A 16 Kbits/s data capability is also incorporated in the transceiver and options extend the facilities to include built-in pseudo-white-noise encryption of both data and speech. The front panel which is removable provides full-control over a simple serial data line. It can be relocated and mounted anywhere on a tank with a radio located in the hull or a similar remote position. The control panel also provides control of two radios from a single remote position. The control panel enables selection of operating frequency and up to nine pre selected channels as well as encryption codes and the transceiver mode. An alphanumeric display gives read-out of frequency and status. First announced in September 1979, the VRM5080 was in production by Racal Radio Ltd in Reading, England for users worldwide and by Kapsch for the Austrian Army. 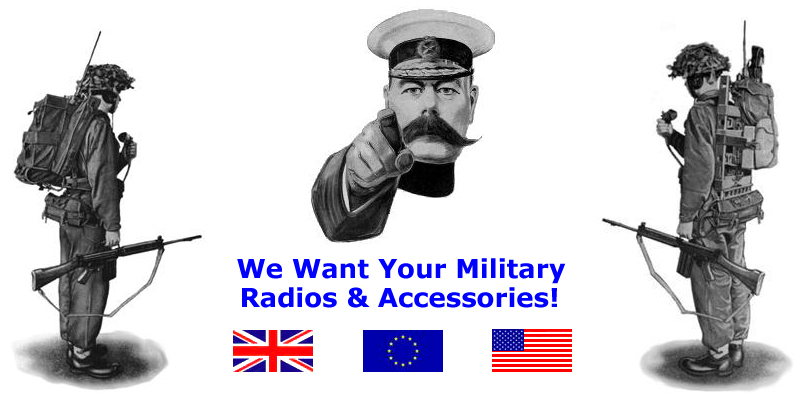 These radios are supplied in good used condition, tested and operational Grade 2. The DOM-410 Geiger Counter or radiation meter was used by Dutch, French and Belgian Army in the late 1970's early 1980's. It is manufactured to high standard under license from SRAT. It is hermetically sealed unit and water tight. The internal X & Gamma sensor is easily removable and is capable of measuring from 1 Milli Rad per hour up to 1000 Rads per hour. Six measurement ranges by direct reading on a single scale. The scale is illuminated for night reading. Overall, it is a very sensitive Geiger counter that is portable and self contained, it is robustly built and designed to take a lot of abuse. The DOM-410 Counter is powered by two standard 1.5 Volt D cells and is supposed to last up to 16 hours on a fresh set of batteries. The DOM-410 counter is supplied in very good working condition with-out any accessories. Some accessories and English language manual are available separately. Receiver-transmitter, FM, 30-74.95MHz, 50 KHZ spacing, 920 channels. Manual tuning version of RT-246/VRC with built-in loud-speaker. The RT-524/VRC is the major part of AN/VRC-12 vehicle radio station typically used in M151 Truck, Utility ?-Ton, 4x4 Mutt Jeeps series of vehicles as well as in older Humvee's and tanks. Operates from 24 VDC vehicle battery or power supply. Transmitter output power 8W (low) and 35W (high). Noise-operated squelch as well as an advanced tone-operated squelch (150 Hz) is provided. The tone squelch provides reliable retransmission when two receiver-transmitter are used as an automatic relay station. The AN/VRC-12 is a combat-proven vehicular radio set that lends its self particularly well to applications of tactical deployment and specific operational missions because of their ability to be assembled into various configurations and of being installed on most types of military vehicles such as M-151 Mutt Jeeps, Humvees, heavy armour, etc. The RT-524 is supplied in good working order Grade 2. Some Accessories and cables are also available. The STR37E VHF Aircraft Radio Transceiver is made by STC Standard Telephone and Cable. It is a small VHF Aircraft Radio Transceiver that can be directly panel mounted in the aircrafts cockpit, easy frequency selection by two large knobs mounted on the front panel. It operates in the frequency range of 116.00 MHz to 135.95 MHz, 400 total channels with 50KHz Channel Spacing. The Squelch and Volume Control along with the ON/OFF Switch are also mounted on the front panel. Transmitter Power Output 1 Watt. It is very nicely constructed with metal chassis. Uses a standart 36 pin Centronics connector on the back panel for DC power and audio interface to speaker / headset and microphone. The radio runs from a standard aircraft 28 Volt power supply. These radios are supplied in very nice condition and include the test certificate. The R-442/VRC is a VHF FM radio receiver working in the 30-75.95 MHz range and has 920 channels.This receiver is part of AN/VRC-12 vehicle radio station, typically used in M151 Truck, Utility: ?-Ton, 4x4 Mutt Jeeps series of vehicles as well as in older Humvee's and Tanks. The radio can be used on its own as a VHF receiver or with the RT-524 as auxiliary receiver. The radio receiver operates from 24-28 VDC @0.75A. The R-442/VRC is supplied in good working order Grade 2. Some accessories and cables are also available.